There is nothing cats love better than to co-work with you at your desk — usually to the detriment of keyboards, coffee cups, and anything that can be thwaped onto the floor. That's why I love this desk design so much. 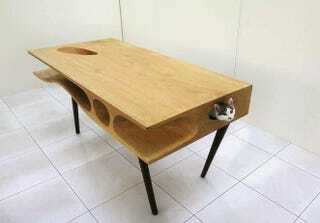 It gives cats a place to sit inside your desk, instead of on top.